The Ultra's innovative modular designs allows you to conquer both land and sea. 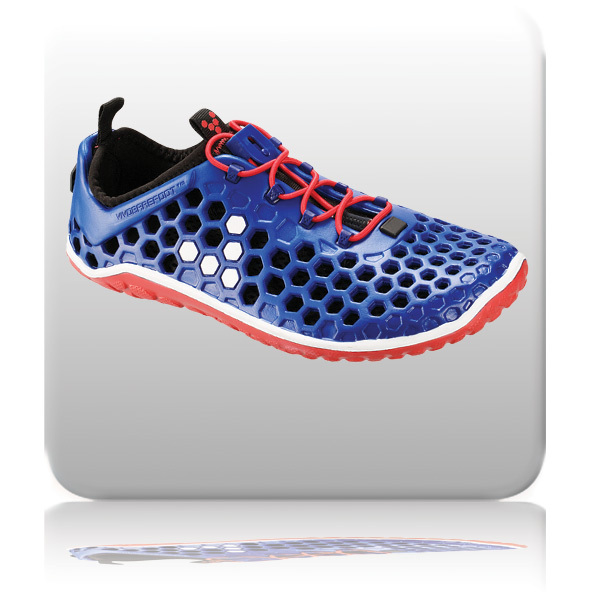 The 3D upper-outsole combines a perforated upper and a dual density, high-abrasion, hex-flex outsole in a single unit. The removable sock, which can be worn independently or plugged into the cage, offers puncture-resistance and thermal protection. 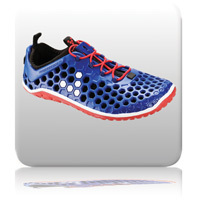 The Ultra also comes with a plug-in, antibacterial, stretch mesh tongue for comfort. Like all VIVOBAREFOOT shoes, the anatomic toe box of the Ultra provides plenty of room for the toes to splay and the foot to move naturally. For a personalized fit, the elastic cord and lock-lacing system fasten quickly and securely. No matter how the shoe is worn, the ultra-thin sole provides maximum proprioception and protection, engaging your senses during amphibious, coastal and light trail pursuits. Lacing - Elastic Lacing: Elastic cord and lock lacing system allow for a quick, secure and personalized fit. Collar/Panel & Lining - Removable: Plug-in stretchy mesh tongue for climate control and preferred fit. Insock - Removable: Plug-in, puncture-resistant sock liner for climate control and/or added protection. Sole Construction - Amphibious: A fully molded, soft, high abrasion injected EVA sole with high levels of durability, grip and traction. Outsole Thickness - 7mm: Starting at 7mm, the amphibious outsole compresses to 3mm with continued use offering maximum proprioception with protection.